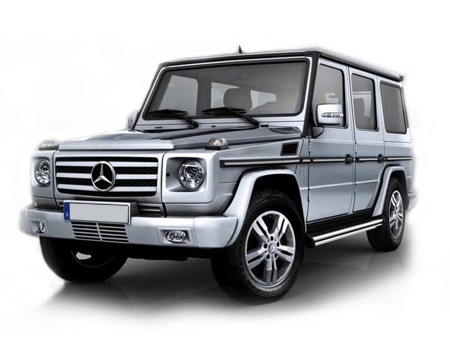 Mercedes Benz G class is Sports Utility Vehicle and is one of those stunning and expensive cars offered by Mercedes Benz. This car is well equipped with all the sophisticated aspects and has a passenger carrying capacity of minimum of 5 passengers. The car has temperature control, navigation system, cruise control, etc. A lot of other advance systems are also equipped in the car. The interiors of the car, including the cockpit area are designed gracefully. The car has bold radiator grille, alloy wheels and trendy headlights. Central lock system, blind spot assistance, anti-theft alarm, etc. ensures car and its driver’s safety. The car has 1 variant with 1 engine, 1 transmission and 1 fuel option. Mercedes-Benz G-Class G 63 AMG – Petrol variant with automatic transmission and ex-showroom price around INR 1,85,00,000. Mercedes-Benz G-Class 55 AMG – Petrol variant with manual transmission. Currently this model has been discontinued.